"Those people [artisanal miners], still joking should style up. Now, I'm not only a director [in the ministry] but also a commander of the Minerals Protection Unit of the Uganda Police Force. So, those illegal artisanal miners still behaving like those in Mubende [who were evicted], they should pack and vacate the mines, otherwise, my police force will them help to pack," Mr Kato said. With the Mineral Police, he emphasized the "madness" of artisanal miners will stop. Kato praised the "Chunga Mazingira Operation", sanctioned by President Yoweri Museveni in which more than 60,000 artisanal gold miners in Bukuya and Kitumbi sub counties in Mubende district were evicted to pave way for an investor to develop the mines. On August 7th, this year, the Inspector General of Police (IGP), created a unit known as Mineral's Protection Police, within the police force. Headed by Ms. Keigomba Jesca, the Unit is charged with implementing policies, plans and strategies for effective security of minerals in the country. The unit was formed days after the army and police evicted artisanal miners in Mubende district. Minerals have a direct impact on revenue, immigration, law and order as well as environmental management. 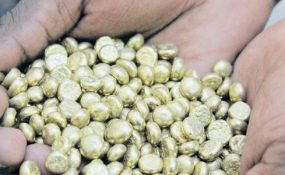 "Artisanal miners have been a big thorn in the mineral's sector. They are a total menace," Mr Kato said. Kato was on Wednesday 4th, October this year speaking at the 6thAnnual Mineral Wealth Conference at Kampala Serena Hotel. Running under the theme "Minerals: Knocking on the door to cause economic transformation in Uganda," the conference is organized by the Uganda Chamber of Mines and Petroleum in collaboration with the Ministry of Energy and Minerals Development. According to a report titled, "Understanding Artisanal and Small Scale Mining (ASM) Operations in Uganda," by African Center for Energy Policy (ACEMP), 2016, there are more than 250,000 Artisanal and Small Scale Miners in Uganda. Eviction of these miners will exacerbate unemployment and impoverishment, especially among the youth and women who work in the mines. However, in a tongue-in-cheek presentation, Mr Kato pledged to organize artisanal miners. "We need to regulate and formalize Artisanal and Small Scale Mines (ASMs), they have become a menace all over. Government shall organize and license artisanal miners and transform their activities into formidable and viable business entities," he said contradicting himself. Artisanal Miners have formed associations in a bid to formalize their mining activities. However, government has been reluctant to recognize these associations. For instance, artisanal gold miners in Mubende formed and registered Ssingo Artisanal and Small Scale Miners Association. The association applied for exploration licenses. The Directorate of Geological Survey and Mines (DGSM) didn't decline to grant artisanal miners a license, but did not even give them feedback. Failure to give feedback contravenes Mining Act, 2003. "We shall ensure that artisanal mining is a preserve for Uganda citizens and encourage joint ventures for small scale mining operations," he said. Dr Elly Karuhanga, the chairman Uganda Chamber of Mines and Petroleum (UCMP) asked government to earmark $ 20 million dollars for the geophysical Aerial survey of Karamoja. The area was left out due to insecurity then. "Why can't we as a country mobilize $ 20 million dollars (approximately Shs 70 billion) and explore Karamoja, a basket for our mineral" Hon. Karuhanga said. Geophysical Aerial survey help to determine the minerals available in an area. On her part, Speaker of Parliament, Rebecca Kadaga pledged to "harass" the Ministry of Finance, Planning and Economic Development to find the money to finance geophysical Aerial survey for Karamoja. "We can't find $ 20 million dollars? Really, I think this is lack of focus and commitment towards the mining sector," Kadaga said.